Steelers' running back Najeh Davenport against the Baltimore Ravens, 2006. The 2006 Pittsburgh Steelers season was the franchise's 74th season in the National Football League (NFL). 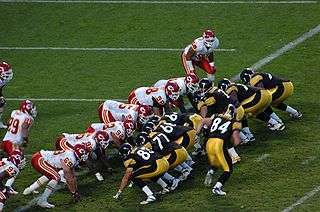 The team was attempting to improve on their 11–5 record from 2005 and also attempting to defend their Super Bowl XL championship. Instead, they finished the season with 8 wins and 8 losses in an unsuccessful attempt to make the playoffs. 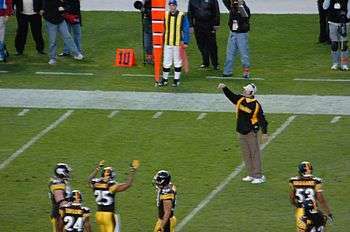 It was Bill Cowher's 15th and final year coaching the team and he retired on January 5, 2007. Vice President – Arthur J. Rooney, Jr.
On March 3, 2006, backup quarterback Tommy Maddox and cornerback Willie Williams (a member of the Super Bowl XL Steelers team) were released for salary cap reasons. 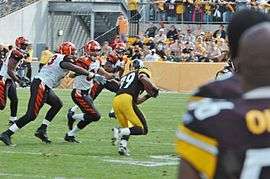 Later on, the team lost wide receiver Antwaan Randle El, defensive end Kimo von Oelhoffen, and free safety Chris Hope to free agency, but picked up safety Ryan Clark from the Washington Redskins. The team used the 2006 NFL draft to fill in the remaining holes on the depth chart. In the first round, Pittsburgh traded up to select Ohio St. wide receiver Santonio Holmes. Then, they used their next pick (acquired from the Vikings) on Syracuse Safety Anthony Smith. The rest of their picks included Florida St. wide receiver Willie Reid, Hofstra guard Willie Colon, Miami University (Fl.) defensive end Orien Harris, Bowling Green quarterback Omar Jacobs, Purdue tight end Charles Davis, California center Marvin Philip, and Virginia Tech running back Cedric Humes. On June 2 members of the Super Bowl Champion Steelers were invited to the White House to meet the President Of The United States George Bush in a celebration to honor the Steelers' successful season. 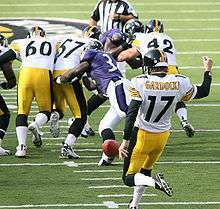 In the offseason Ben Roethlisberger suffered a near death accident while riding his motorcycle in downtown Pittsburgh. He was not at fault, and an out of state vehicle failed to yield and hit him. Ben reportedly was moments away from dying due to a cut artery, however medics stopped the bleeding in time. This set Ben back for training camp and the Preseason. However he did manage to play in part of the Preseason games. Shortly after the Preseason however, Ben required an emergency appendectomy which caused him to miss the first game of the season. Between both of these events, Ben reportedly lost 15 pounds and was not up to form with the team due to lack of practice time and time spent in camp. His health early in the year is pointed to as the cause for a rough season. He experienced continued problems in the Atlanta Falcons game in Atlanta during the year. He was hit after throwing the ball by multiple defenders, one of which caused a helmet to helmet collision. Roethlisberger was diagnosed with a concussion and had to sit out the rest of the game and appeared to have difficulties in the next couple of games. The Steelers went back home for an AFC North fight against the Cincinnati Bengals. In the first quarter, running back Willie Parker scored on a 3-yard touchdown run. However, on the very first play of the second quarter, quarterback Ben Roethlisberger threw an interception and Cincinnati was able to score shortly after with quarterback Carson Palmer completing a 16-yard touchdown pass to wide receiver Chris Henry. On Cincinnati's next drive, the Bengals scored on a three-yard touchdown pass to Henry. In the third quarter, the Steelers rallied a comeback, as kicker Jeff Reed kicked a 37-yard field goal. 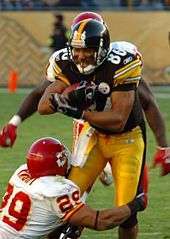 Shortly after, Parker scored on a one-yard touchdown run to give the Steelers a 17–14 lead. Pittsburgh's lead deteriorated as Ricardo Colclough muffed a punt, allowing the Bengals to recover. Carson Palmer then helped put Cincinnati ahead on 9-yard touchdown pass to T.J. Houshmandzadeh. Cincinnati was able to increase their lead when Pittsburgh's running back, Verron Haynes lost a fumble, allowing Palmer to complete a 30 yard touchdown pass to Houshmandzadeh on the next drive. Reed would help Pittsburgh out with a 36-yard field goal. Despite the Steelers out-gaining the Raiders 360–98 in total offense, Roethlisberger threw four interceptions (two of which were returned for touchdowns), which led to Oakland's first back-to-back victory of the year. 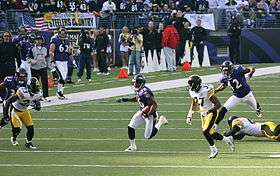 Not only did Baltimore's offense help contribute to the Steelers dropping to 4–7, the Ravens defense (anchored by the return of veteran LB Ray Lewis) was also a huge factor, as they sacked Roethlisberger nine times and forced two interceptions. Pittsburgh's defense held the Bucs to three points. Following a road loss to the Ravens, the Steelers went home for a Week 13 fight with the Tampa Bay Buccaneers, who were visiting Pittsburgh for the first time since 1983. In the first quarter, the Steelers scored first with QB Ben Roethlisberger's 2-yard TD pass to TE Jerame Tuman for the only score of the quarter. In the second quarter, Pittsburgh increased its lead with kicker Jeff Reed's 50-yard field goal for the only score of the quarter. After a scoreless third quarter, the Steelers continued their dominance in the fourth quarter. Roethlisberger completed a 16-yard TD pass to TE Heath Miller, while Reed nailed a 39-yard field goal. The only response from the Bucs was on the final play of the game, when kicker Matt Bryant spoiled Pittsburgh's chance for a shutout with a 27-yard field goal. The win improved the Steelers' record to 5–7. ↑ 2006 Pittsburgh Steelers Media Guide. ↑ 2007 Pittsburgh Steelers Media Guide. ↑ "2006 Pittsburgh Steelers". Pro-Football-Reference.com. Retrieved 2014-12-27. ↑ "2007 Pittsburgh Steelers". Pro-Football-Reference.com. Retrieved 2014-12-27. ↑ Cook: Batch meets the challenge. Retrieved 11–11–06.